The OPTI-PAK®'s unique hardware design integrates a PEEK holder with an auto-adjusting stem which provides a fluid interface with any 10-32 standard injector port, and guarantees a zero-dead-volume connection despite variances in tube stop depth. A proprietary method of frit placement allows the packed stem to be positioned directly into the flow path, which eliminates all excess swept volume. Less swept volume translates to absolute minimum sample dilution and dispersion. The elegant, flexible design of OPTI-PAK makes it amenable to virtually any trapping application. Installing an OPTI-PAK into the outlet of a switching valve will facilitate the trapping, desalting, and pre-concentration of an analyte mixture. With OPTI-PAKs versatility, a second trap can be added downstream in the loop of an injection valve and effectively perform a 2D separation. 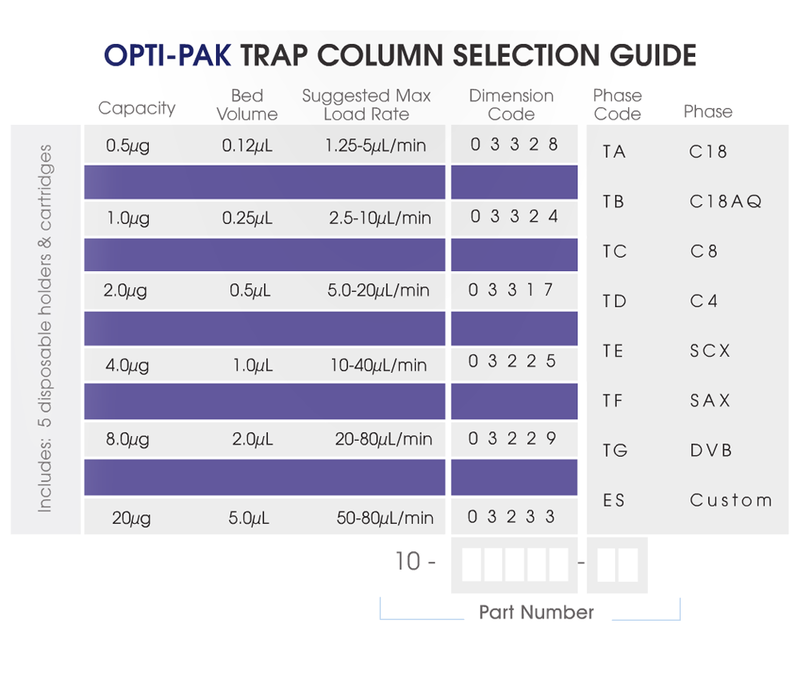 Click the button below to add the OPTI-PAK® Trap Columns to your wish list.